The lecture will address the relevance of Edward Said’s Orientalism for the contemporary study of women and gender in the Middle East. What are the main challenges of researching and talking about gender in the Middle East? 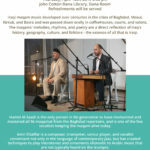 What are the continuities in our engagement with Orientalism and where do we find ruptures and limitations? Based on empirical research as well as activism in relation to Egypt, Iraq, Turkey and Lebanon, this lecture will discuss the centrality of a gendered analysis in understanding recent developments in the region. It will pay particular attention to the centrality of body politics in challenging authoritarianism. 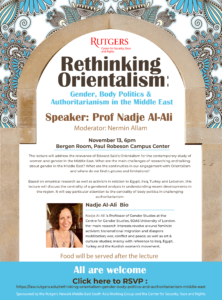 Nadje Al-Ali is Professor of Gender Studies at the Centre for Gender Studies, SOAS University of London. Her main research interests revolve around feminist activism; transnational migration and diaspora moblization; war, conflict and peace; as well as art & cultural studies; mainly with reference to Iraq, Egypt, Turkey and the Kurdish women’s movement.